【Compatibility】:This watch band is compatible with any Apple iWatch Model, including Apple Watch Series 3, Apple Watch Series 2, Apple Watch Series 1, Apple Watch Nike+, Apple Edition, Apple Watch Hermes 38mm/42mm etc. 【Length-adjustable】:There are 3 H-shaped clasp which could remove to resize the band according to the size of your wrist,It ensure a perfect fit. 【One Button Remove/Replacement】Easy to lock into your Apple Watch and one button removal without any tool. 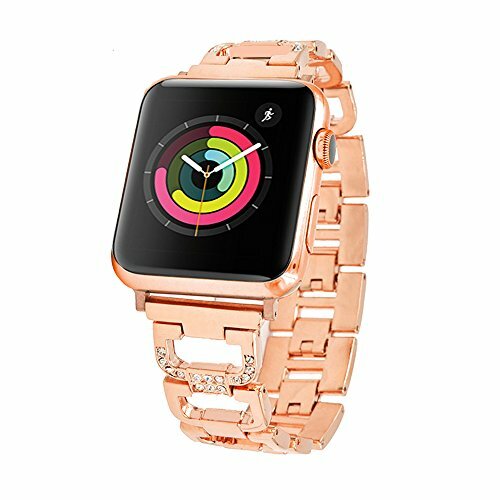 You can swap it easily with different color or other Apple Watch band. 【Perfect Design&Materials】:The smooth premium alloy wraps fluidly around your wrist. the inlaid shining rhinestones and unique D&H-shaped Design make it looks more elegant and beautiful. 【Fit Wrist Size】Fit for wrist size :5.7\'\' - 8.6\'\' ,Please contact us if you got the defective item,we will find a good solution for you.